John Mershon has been working on and off for the Arroyo Grande Police Department in various capacities since the late 1970s. Currently, he works as the department's full-time property and evidence technician. On April 24, the 68-year-old Mershon stood before the dais at an Arroyo Grande City Council meeting and asked its members not to get rid of his job. 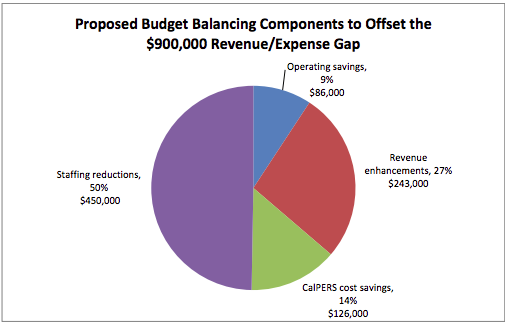 PAINFUL CUTS A proposed reduction in staff at multiple city departments, including the police, may be necessary to address a $900,000 budget gap in Arroyo Grande. "I've never had a day that I didn't want to work here," he told the council. "I love my job. ... I don't want to leave." Mershon's job is one of a handful of positions potentially on the chopping block as the city seeks to close an anticipated $900,000 gap in its next two-year budget. As part of a larger package of measures to close that gap, city staff suggested eliminating as many as nine full- and part-time positions from three departments, including the police, which could save an estimated $450,000. While cutting staff may save the city money, city officials acknowledged that it would also result in very real impacts to some city services. "We are saying things we've never had to say before," City Manager Jim Bergman told the council. "If the ultimate goal is to get us sustainable ... that is where we have to go ... and it's a difficult place to go." At the city's Community Development Department, staff suggested eliminating the associate planner and planning technician positions and replacing them with a full-time assistant planner position, as well as dropping a part-time planning intern position and moving to all-volunteer intern positions. A city staff report also suggested removing the department's administrative secretary position and reclassifying an existing senior office assistant position to a full-time permit technician position. The staff report noted that getting rid of those positions would shift more work onto other planning staff and result in delays to the East Grand Avenue Master Plan, the Halcyon Road Complete Streets Plan, and other long-term initiatives. City staff also suggested closing City Hall to walk-in customers one day a week and shortening counter hours. In the city's Public Works Department, jobs up for possible elimination include a currently vacant part-time associate engineer intern position, as well as three part-time parks maintenance workers and another part-time street maintenance worker. Those cuts would result in a 30 percent reduction to the mowing, trash pick-up, and maintenance at the city's parks, picnic areas, and other facilities rented to the public. Cuts proposed to the city police department not only included getting rid of Mershon's job, but also suggested cutting a vacant part-time mapping and crime analysis intern position, as well as cutting the budget of the department's reserve officers by $40,000. The potential cuts to the department drew criticism from Phillip Dollman, vice president of the Arroyo Grande Police Officer's Association. He said he was particularly concerned about the impact of eliminating Mershon's position. "Poor handling of evidence can expose the city to liability and jeopardize criminal prosecutions," he told members of the council at the meeting. During his comments, Dollman also noted that part of the reason for the city's budget shortfall was due to a proposed increase in funding to the Five Cities Fire Authority. "We are certainly not willing to sacrifice core and essential positions to fund increases for the unsustainable Fire Authority," Dollman said. Councilmember Caren Ray warned against inter-departmental feuding. "As we go forward with this discussion, I really don't want to see different departments pointing fingers at each other. ... We are in this together and we've got to figure this out." The council made no decision on the staff cuts at the meeting. In addition to the cuts, city staff also recommended paying down $5 million in unfunded pension liability over two years, as well as increasing fees for community development and recreation services to cover the budget gap. "We are getting to the point where every $1,000 matters," Bergman said.